Youth Release: Where will you sleep tonight? It’s been a year since I slept in my own bed at home, a year since I’ve had the comforts of home and all that comes with that. I find myself counting down the days until I can sleep in my own bed, in my own bedroom, in my home. Could you imagine if you never had your own bed to sleep in? Could you imagine never having a bedroom, even a shared one? Could you imagine never having a place to call home? I know I couldn’t, but for many of the children that live in Dire Dawa this is their reality. Their home is the spot on the street where they can find space to put their bed, many times a piece of cardboard, or a garbage bag, their bedroom is the city that they share with over 18,000 other street children and thousands more adults. Their dreams are interrupted by others taking their space, others trying to take the little food they have and others trying to exploit them. They don’t have the comfort of their own home, bedroom and bed, but we can change that. 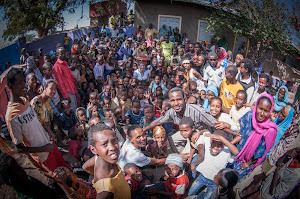 I remember my first experience of children living on the street, we had just arrived for the Youth Release first volunteer trip to Dire Dawa. As we drove into Dire Dawa, children started following our car to get a better look at the ‘fereinge’(white/foreigner). We all jumped out of the car and were flooded with children, they were laughing, and jumping on us, touching us, and some even cried as they had never seen a white person. We walked from the little town of Dire Dawa to our compound with probably 100 children accompanying us. I guess in my naivety I just thought they were children playing in the street that were excited to meet us, they in fact were mostly children who lived, worked and played on the street but it would take me a week or so to realise that. Later that evening (around 9pm) we took a walk around the city, in the pitch black dark, our host had to tell us to watch for potholes because they are so big you could fall in them. Trying to walk in the dark and not fall into pot holes proved much more difficult than it sounds. We walked for maybe 30 minutes and during that time, children were coming to shake our hand and ask our names. As we walked on, I saw a little girl, who was maybe two/three years old, sitting alone on the side of the street. As we were approaching her, I couldn’t take my eyes off her, waiting to see her mother get her, or at least an older sibling. No, that’s not what happened, as we got closer, I realised she was begging for food, money, anything we could give her. I stopped to talk to her, and we asked where her family was, begging some where else she told us. I remember the sheer anger and sadness I felt, thinking that a child that young was alone at night, begging. Our host told us she would beg late into the night and then sleep in that spot. As the weeks passed, this was a common occurrence, seeing children begging late at night, alone. Many of the children at the Youth Center have lived on the street at one point or another, many of them were on the streets until the project gave them assistance. Through the program, they are now able to get an education or a training, allowing them to get an income so they can afford their own bed, their own place to call home. They won’t ever have to sleep on the street or beg for food late into the night, they can provide a home for their younger siblings and make sure they never have to sleep in the street again.